Over a Month of Being More Fit And What Has It Gotten Me? I didn’t eat this burger, I prefer my Double-Doubles with lettuce, tomato and grilled onion only. No condiments. I’ve lost five pounds, which I found surprising, and everything else is migrating back to places where they should be as opposed to the weird blubber that was forming around my middle. I have not achieved my goals yet, but things are coming along. Oh! And I had a cheeseburger the other day! 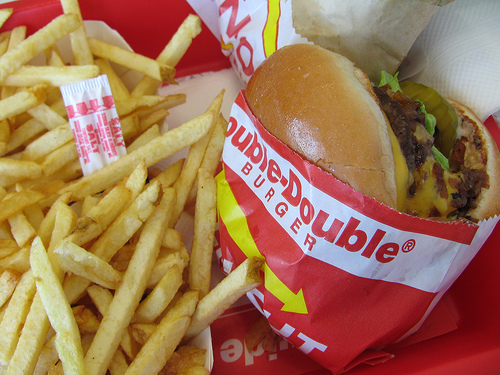 In-N-Out, hence the picture, and it was so good! I had been craving a burger and it felt like more than a junk food craving. It’s possible I am not getting quite enough protein regularly because the burger urge hit a peak and I had to give in. I actually felt better after eating it as opposed to bloated and gross. Not sure if that’s mental or actual, but I’m going with it. One Response to Over a Month of Being More Fit And What Has It Gotten Me? I was just commenting to Scott the other day that the worst (and best) part about eating healthy most of the time is that when you do give in to the cravings and eat crappy fast food, you feel like you’ve eaten crappy fast food…the bloating, feeling over-full for an hour, and all that. However, I don’t ever feel that after eating In-n-Out, so when I am feeling the burger cravings I generally opt for them instead of Jack in the Box or Carl’s. Congrats on the 5-pound drop!